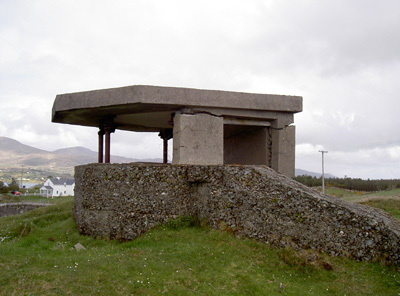 Berehaven and Queenstown were the sites of the two British naval bases in Southern Ireland until 1938. Berehaven (Harbour) is in Bantry Bay on the southern Irish coast. Queenstown (now reverted to the former name of Cobh) is on the eastern coast of Southern Ireland. Antisubmarine indicator loop stations were planned for these ports by the Royal Navy in the late 1930s but political events regarding independence and neutrality made the Admiralty rethink its defence strategy and alliances. The story of the planned loops at Berehaven and Queenstown make an interesting case study in British naval policy and planning. Indicator Loops are long lengths of armoured cable laid on the seafloor of harbors to detect enemy submarines. They were developed by the Royal Navy in the early 1900s and first trialled at the end of WW1. They were successfully deployed in WW2 in British ports and other Commonwealth countries such as Australia, Canada, New Zealand, South Africa, Kenya, Ceylon, Penang, and in allied harbours (Iceland, Holland, Dardanelles). The loop defences planned for Ireland were cancelled before the war but it is interesting to see what the British Admiralty were thinking. This diagram shows the arrangement of the cables in the loop ("3-legged") and the tail cable connecting them to the shore station. The two Irish ports have somewhat different histories but naval policy at both had much in common. First to Berehaven. Berehaven Harbour is located in Bantry Bay, West Cork, next to Sliabh Miskish and the Caha Mountains of the Beara Peninsula. 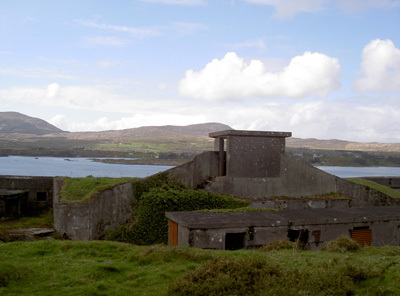 It is approximately 9.5 km long by 3 km wide, with the main axis of the island orientated east-west and lies between Bere (or Beare) Island and Castletownbere. 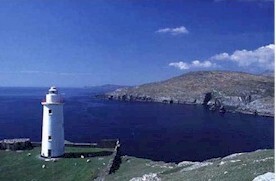 Bere Island is approximately 18.5km2 in area and lies about 1.5 km offshore from Castletownbere. Until the 13th century the island was called Ins Greagraidhe after its inhabitants, the tribe of Crecaighe. It then bore the name Great Island until Berehaven was renamed after a Spanish princess called Beara who married an Irish chieftain from the area. Bantry Bay is one of the largest sea-inlets in Ireland measuring some 30km long and 10km wide at its mouth which opens out into the Atlantic Ocean. In the 17th century the lands around Bantry were extensively planted by English colonists and this influence was to have an extensive impact on the area over the next three centuries. In the later part of the 18th century its strategic military importance was recognised and the Bay was heavily fortified (see photos below). The Battle of Bantry Bay known as the "greatest naval battle ever fought in Irish waters" was fought between the British and the French navies in 1689 between Bere Island and The Sheep Head Peninsula. The battle was so severe that a lot of the locals left their houses and took to the hills for protection. . The French, who were landing money and trooped for the Catholic army at the Battle of the Boyne, routed the 22 English ships. In 1796, inspired by Wolfe Tone, the French attempted another invasion to free Ireland from British control. A storm blew up and the ships were scattered so the French invasion failed. Following this failed invasion the English recognised the strategic value of the Bay and began a programme of intensive fortification of its coastline. The British Government decided to fortify Berehaven Harbour and Bantry Bay against the other attacks from the sea. 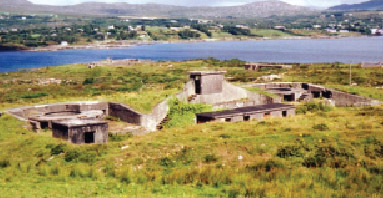 Bere Island was attractive as a naval base because it had deep water nearby, the calm sheltered waters between Bere Island and Castletownbere (called Berehaven Harbour) and its ready access to the Atlantic Ocean. The first attempt at fortification took place immediately after the invasion attempt when a series of temporary batteries were erected at strategic points in the upper Bay area and appear to have been sited primarily to protect against a naval landing and subsequent advancement onto Cork (Cobh or Queenstown). The Bay underwent a second major period of fortification in the latter part of the 19th century. A compulsory purchase order was made on the 17th March, 1898, after which tenants were cleared from the East end of the island. The reason for these fortifications was to protect British Dreadnoughts when they were in port, as they needed 48 hours of â€˜elaborate protection while routine maintenance had to be carried outâ€™ and while they got up sufficient steam in their boilers. This phase of construction led to the construction of seven gun batteries. 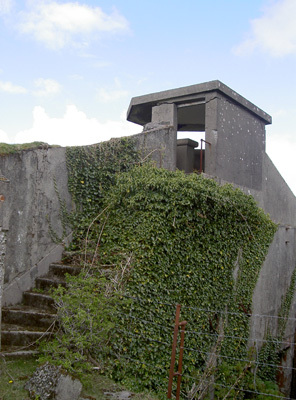 Derrycreeveen Battery -2004. 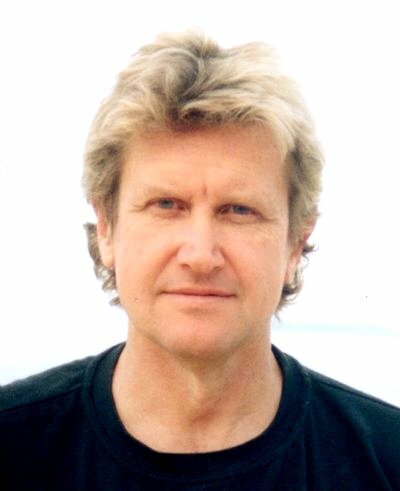 Photos by Kieran Sidley. The harbour entrance to Cobh is a narrow channel 2 km long with an average width of 1.5 km and is covered by Spike Island immediately to the north of the channel. The main anchorage lies to the east of the harbour and was said to be capable of holding a fleet of nine battleships, two cruisers and twelve destroyers with adequate shelter from all winds. This deep natural harbour at Cork has from earliest times attracted trade. Since the time of the Viking longships, the harbour has seen the arrival and departure of thousands of vessels. These have included sailing ships of every description, among them French and Spanish vessels bringing in wine and spices, convict ships taking transportees to Australia and nineteenth century emigrant ships. For a while Cobh (pronounced 'cove') was called Queenstown in honour of Queen Victoria, who landed here on her first visit to Ireland in 1849. The strategic importance of Cork began during the Napoleonic War when the harbour became a naval anchorage from where the entrance to the English Channel could be covered and the blockade of France maintained. Defences had been built in the seventeenth century for the immediate protection of the city and in the mid-eighteenth century a fort had been built at Cobh to cover the anchorage. During the American War of Independence the beginnings of what later became Forts Camden and Carlisle were started at the narrowest point to close the harbour entrance. In the comprehensive review of coastal defences undertaken by the Joint Naval and Military Committee in the last decade of the nineteenth century Cork Harbour was classed as a port of refuge for merchantmen in time of war as well as a naval base. Merchantmen would have the option of sailing to Berehaven on the South-West corner of Ireland or Cork Harbour before being passed into the Channel or the Bristol Channel as necessary. Accordingly the Committee proposed a number of changes to the existing armament:During the First World War Cork Harbour was used as a naval base covering the western approaches and dealing with the U-boat menace. A boom and anti-submarine net were established to the east of Spike Island. GOVERNMENT POLICY TOWARDS QUEENSTOWN AND BEREHAVEN. 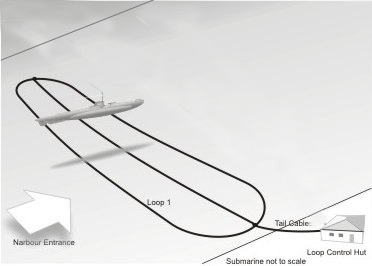 The anti-submarine loop stations planned by the Royal Navy for the Southern Irish ports of Queenstown and Berehaven make an interesting case study. Britain became politically involved in Ireland in the 12th Century, slowly tightening its grip until British supremacy was obtained in the 16th Century. The Irish then began their long struggle to free the island from British rule. The two southern ports of Queenstown (Cobh) and Berehaven (Bere Island) had become a vital feature in the naval defence of Britain's food supply. After the insurrection against British rule in Ireland in 1916 which raged for 5 years, an Anglo-Irish Treaty was signed in 1921. In this treaty, the Republic of Ireland (Eire, or Southern Ireland - which contained 26 of the 32 counties of Ireland) was denied having its own navy and Britain retained the use of naval facilities at three 'Treaty' ports â€“ Berehaven, Cobh and Lough Swilly â€“ on the assumption noted by Winston Churchill â€˜that without the use of these ports it would be very difficult, perhaps almost impossible, to feed this Island in time of warâ€™. In 1922, Winston Churchill - as Colonial and Dominions Secretary - took the First Sea Lord - Admiral Beatty - to the Colonial Office to explain to Irish Nationalist leader Michael Collins the importance of these ports. Collins was immediately convinced: "of course you must have the ports, they are necessary for your life" Churchill quotes in his memoirs. During the First World War the anchorage became the fuelling bases from which the RN destroyer flotillas ranged westward into the Atlantic to hunt U-Boats and protect incoming convoys as they reached the throat of the narrow seas. It was said to be so crowded that you could walk from island to mainland across the decks of battle ships. During the inter war years the value of maintaining the Treaty Ports was considered on a number of occasions by the Admiralty. In a potential war with Germany, the Royal Navy required Cork Harbour as a base for anti-submarine units and mine-sweepers to cover the western approaches; if Cork Harbour was not available for any reason anti-submarine units could be used from existing bases in England but because of the extra distance to be covered would only be able to patrol for a shorter time and distance as compared to operating out of Cork. There was the attitude of the Free State (Southern Ireland) Government to be considered, in any future conflict; if it was hostile then the Treaty Ports could not be used to their full advantage, unless the surrounding hinterland had been seized and occupied which would entail using troops that could be better used elsewhere. Any occupation would alienate the majority of the people in the Free State causing an added problem in that the Treaty Ports would have to be supplied by sea rather than by land. 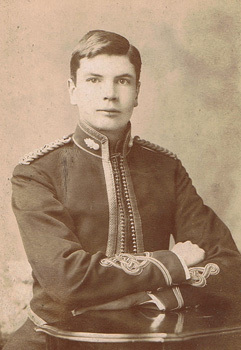 In the light of all these considerations the advice of the Defence Chiefs to successive governments was the establishing of friendly relations with the Irish Free State with a view that in time a satisfactory agreement on the use of the Treaty Ports, especially in time of war, could be concluded. So everything worked smoothly for 16 years. 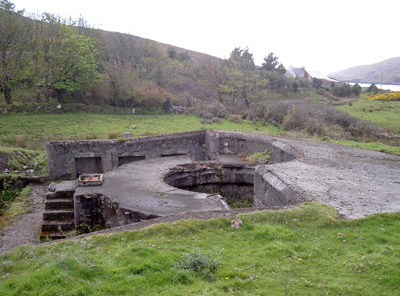 On February 4th, 1938, the Captain of the Admiralty's antisubmarine base at HMS Osprey (Portland Naval Base, Dorset) set out the requirements of the planned Indicator Loops and Harbour Defence Asdics (HDAs) for Berehaven and Queenstown. In short Berehaven was to be fitted with two indicator loops requiring 14 nautical miles of lead loaded "loop" cable (Admiralty Pattern 1989) and 3 mi. of tail cable Adm Patt 7048. For the one HDA, 1 mi of Patt 9610, 5 mi Patt 660 and 5 miles Patt 841b. Queenstown was also to be supplied with 2 loops requiring 20 mi Patt 1989 and 5 mi Patt 7048; and with one HDA requiring 1 mi Patt 9610, 3 mi Patt 660 and 3 mi Patt 841b. All loops and HDAs were to be laid by HM Cableship "Lasso" in the Spring of 1940. For details about the construction of the cables go to the cables and cablemakers web page. However, 7 weeks later, on April 25th 1938, Conservative Prime Minister Neville Chamberlain negotiated an agreement with Irish Prime Minister Eamon de Valera to hand back British control of the ports to the Southern Ireland government. He did so in the face of vehement warnings by Churchill that it was a grave mistake to appease de Valera for no reciprocal concession. Eireâ€™s neutrality and consequent refusal to allow Allied use of her ports and airfields was perceived to have cost the lives of significant numbers of British and American sailors during World War 2. To abandon the ports meant that the RN flotillas had to start in the North from Lamlash and in the south from Pembroke Dock or Falmouth, thus decreasing their radius of action and the protection they could afford by more than 400 miles out and home. Churchill was appalled at the "gratuitous surrender" of the Chiefs of Staff but as he was not in any position of authority within the government there was little he could do. He alone in parliament opposed the agreement and said the Liberal and Labour members were seriously hoodwinked by the issue of Southern Irish neutrality. "A more feckless act can hardly be imagined" he said, "for it will be impossible to retake the ports when needed as some members have suggested". The Times newspaper claimed that this was a benefit to Britain as the Royal Navy didn't have to waste resources defending Irish ports. Many a ship and many a life were soon to be lost as this "improvident example of appeasement" (Churchill's words). By the 5th September 1939 - just two days after war was declared on Germany - the Admiralty was concerned that Irish malcontents would be succoring U-Boats by providing them with fuel. The Admiralty also asked for a report into how the loss of Bereshaven and Queenstown was disadvantaging the fleet (with a view to retaking the ports in spite of the political problems of Eirish neutrality). By the 29th September 1939, Churchill said there was evidence of the Irish providing support to U-Boats and that de Valera dare not interfere. "On no account must we appear to acquiesce in the odious treatment we are receiving (from the Irish)" Churchill wrote. Thus, the planned loop stations in southern Ireland - Queenstown (Cobh) and Berehaven (Bere Island) - were duly cancelled in 1940 (well, they hardly could do anything else since ceding their right to the ports). 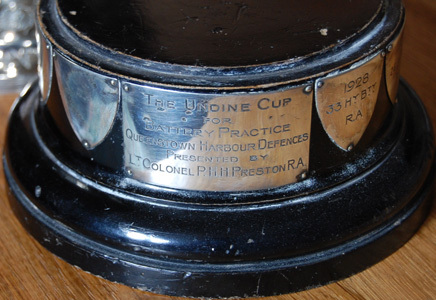 In the late 1920s a competition for Battery Practice at the Queenstown Harbour Defences was held and a large silver cup - The Undine Cup - was awarded to the winning battery. The cup was presented by Lt Col PHH Preston RA. 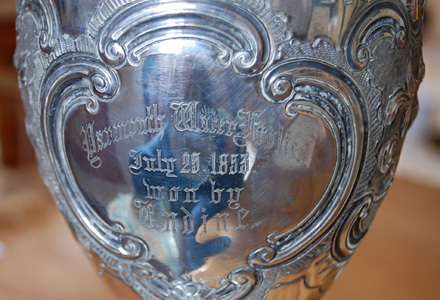 It seems that the trophy was a recycled silver cup won by the yacht Undine at Yarmouth by the Preston family in 1853. The Undine may have raced off Cork but the present owner of the cup - Sir Philip Preston Bt - grandson of Lt Col Preston - is unsure. Yarmouth Water Frolic. July 25, 1853, won by Undine. 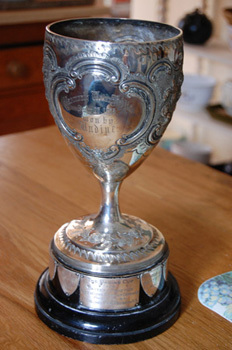 The cup is has ten small silver shields around its circumference, intended clearly to carry the name of the annual winner. Only three are engraved (see below). Opening days: Strictly by appointment; telephone to arrange visit. Traces the military development of the island of Haulbowline, from RN Dockyard & Royal Army Ordnance Corps occupation in Napoleonic times through to the present Irish Naval Service base. 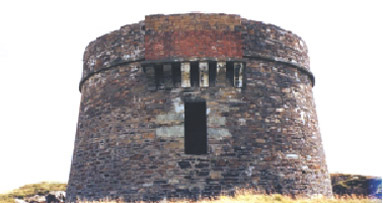 Paintings, photos & artefacts, mostly in restored Martello Tower. If you have any further details of the Berehaven and Queenstown naval bases that may help with this research project please email me at the address at the top of the page.